The Outlaws claimed a 14-13 victory over the Ohio Machine on Sunday afternoon amidst cold, wet, windy, Midwestern weather in Ohio. Team Bocklet… I mean the Outlaws were paced by Mike Bocklet, who tallied four goals, a hat trick from Jeremy Sieverts, and a dominating performance at the faceoff dot by Anthony Kelly. Every good story has a beginning, a middle, and an end. Clearly Mike Bocklet got the memo before Sunday’s tilt against the Machine. Not only did the eldest Bocklet open the scoring 15 seconds into the game, he also opened the scoring in the second half a mere 35 seconds into that frame. Perhaps the most exciting plot point in this drama came on his third goal, which came off of a pinpoint clearing pass from goalie Jesse Schwartzman. Bocklet lowered his shoulder into his defender as he neared the crease and then opted to loose a behind the back strike as his angle decreased exponentially that found the back of the net. Just in case that wasn’t convincing enough Bocklet, Michael (read: Bocklet comma Michael) put the team on his back in the final moments with a hard drive to the cage, and burying the game winner with fewer than two seconds remaining on the clock. Greg Melaugh. Not only did I have no idea who he was when the Outlaws acquired him, but I brutally mispronounced his surname (it’s “Me-Law” not “Me-Laff”). Mea culpa Greg. Anyway, he’s been splitting time in the third attack position with the aforementioned Mike Bocklet and he’s quite a shifty player. Melaugh’s bio stats aren’t even listed yet, but he’s got to be around 5’ 7” and a buck seventy-five soaking wet. His diminutive stature enables him to slip through seams and to get open. Yet he’s not afraid to dodge against defensemen much larger than him. There’s a toughness and tenacity that makes Melaugh fun to watch. 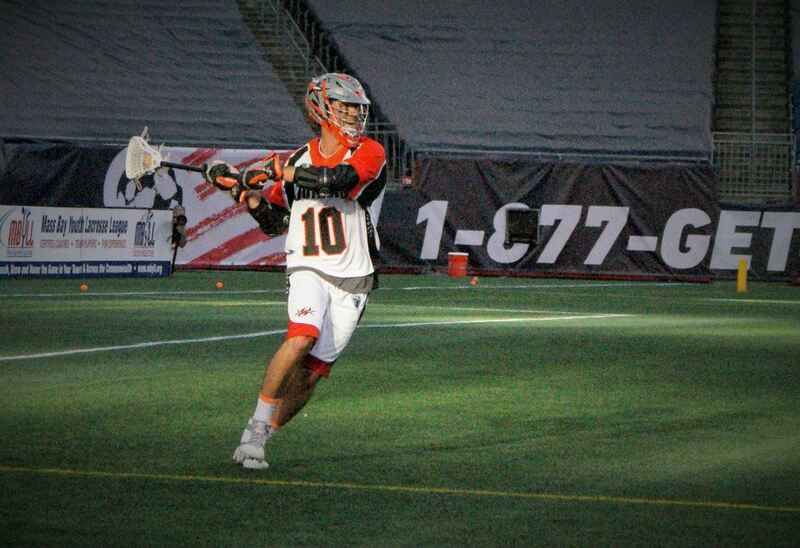 The Outlaws’ defense looked better against Ohio than it did against Boston last week, and with all the firepower the Machine have they pretty much had to if they wanted to come away with the W. (By the way, welcome back Ken Clausen! The UVA grad played a solid game and seems to be back to his old form after fighting injuries for years.) Of course, the buck stops with goaltender Jesse Schwartzman and the big man made like Reba and “put a stopper in the bottom of the tub.” The only thing left to do was to bag it, tag it, and sell it to the butcher in the store. And sell is the great Schwarty did. He sold it right down the field. I tend to think that a beautiful outlet pass from a goalie needs to be seen live to be appreciated. I never realized how amazing Schwartzman’s outlet passes were until buying Outlaws season tickets last year, but boy, oh boy, were they impressive. Well, number 19 certainly hasn’t lost his touch, as he basically assisted on Bocklet’s third goal. Also, I’m giving Schwartzman a pass on the Brian Farrell goal that tied the game with 23 seconds remaining. Farrell unloaded from about eight yards out with a longpole. In other words, the distance from the cage combined with the release point of a longpole pretty much makes that shot impossible to stop. In my preview of the Denver/Ohio game I suggested it would be a close game. Check. I also predicted that faceoff specialist Anthony Kelly would have an amazing game. That said, I figured he might be in the high sixties, maybe the low seventies. But 80 percent? No, I didn’t think he’d be that dominant, and not because he’s incapable of such a performance. Clearly he is, going 24 for 30 on the day. But rather it’s that no one wins 80 percent of their faceoffs in MLL. There’s just too much parity in the league. So thank you Anthony Kelly for re-defining what is possible.